The fading light on the western horizon manifested the imminent arrival of the darkness of the night that would soon engulf the jagged mountains.The formidable mountains always stood stark and motionless, as if standing witness to the long chain of events shaping this remote landscape. Sometimes though, it seemed as if the mountains spoke, as if there was a soul hidden deep beneath the rock and shale faces that had jutted out some 70 million years ago when the Indo-Australian and the Eurasian plates collided to give birth to the Himalayas. Twilight in the mountains. 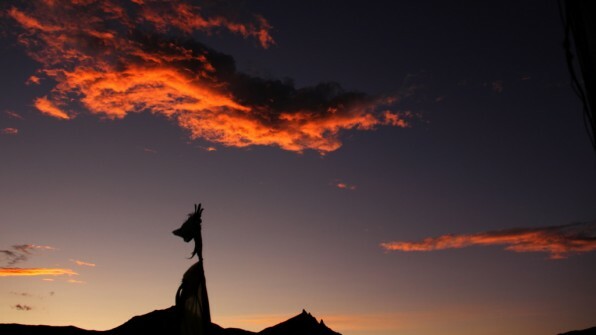 A Buddhist prayer flag and a mountain peak visible in the foreground. When the spring knocks at the door of the mountains, the flowers bloom and a riot of colours commences.The furious wind turns into a warm-gentle breeze, while the butterflies hop from flower to flower in search of the elixir. The blue sheep graze leisurely in the lush green meadows and all life forms seem to enter some idyllic lull, enjoying the fleeting warm weather and a short period of bounty, in an otherwise harsh landscape. The period of bounty and salubrious climate. Come winter and the landscape is completely transformed. The greenery vanishes and the white snow covers the mountains and meadows as far as the eye can see. One thing however does not change; the mountains keep nurturing and nourishing a variety of life forms as they have done for millennia. A lone Blue sheep looks over from the gradual-rolling meadows. 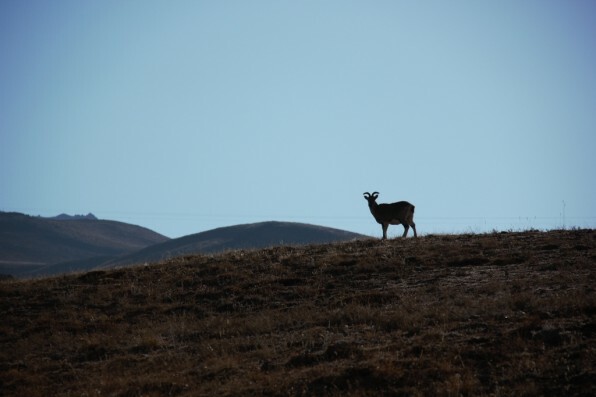 The meadows support wild ungulates as well as the livestock of the people. An hour had passed since the last rays of the fading sun had vanished from the face of the tallest peak; Mount-Kanamo, a beautiful and distinct mountain at approximately 6000 meters. 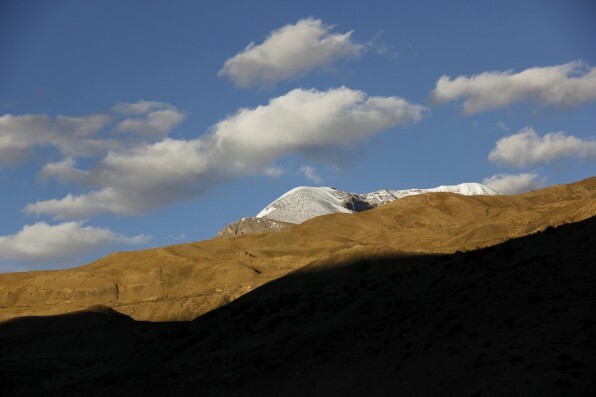 Mount Kanamo, a beautiful mountain peak located at approximately 6000 meters. With sun going down, the temperature had plummeted down to 15 below zero. Amitayus (the snow leopard), was still resting in the cliffs inside the Badang nullah soaking up the comforting heat from the warm rock surface. The wind was gradually picking up and the exposed rock surface would soon be bereft of its latent heat and the comfort it provided. After a while, Amitayus felt the incessant, cold wind pounding on his battered, weather beaten face. Being the dominating giant that he was, he had lost his long-thick tail during a skirmish when a younger, somewhat arrogant male had dared to challenge his authority over his mountain kingdom. That furry tail would have provided some respite from the cold wind, but that was not an option now. Deciding that discretion was the better part of the valour, Amitayus moved a bit deeper inside the cave beneath the overhanging cliff. Ten years had passed since Amitayus was born in these mountains. No one knew where exactly he was born, but Amitayus had faint memories of being chased away rudely and incessantly by the mother without any rhyme or reason. He had travelled miles, hiding from other dominant males, often going hungry for days and occasionally stealing a sheep or goat from an unwary herder. The tiring and dangerous journey had lasted several weeks till he finally settled down and started marking a small 80 square kilometer area as his home. The snow leopard landscape. Meadows, cliffs, gorges and ridgelines along with the towering peaks form home to the most mysterious cat of the high mountains. The night was cold and chilly but Amitayus had eaten well and half a carcass of a blue sheep still lay in the cave. There was nothing to be worried about at least for a couple of another days. The only thing that had troubled him today was a restless young chap with big snow boots, a bag slinging on his back and a pair of binoculars stuck perpetually on his face. The fellow had been too close today and kept scanning the mountain slopes with unceasing zeal. To the surprise and relief of Amitayus he appeared to have not a clue that he was lying there, right under his nose. Finally with the onset of the night, the fellow had decided to give up and retreat, but not before building a cairn on the narrow trail that Amitayus would have to use, to walk out of the cliffs and over to the rich meadows of Gete, where blue sheep grazed in plenty. Having spent the entire day lazing around, the fall of the darkness seemed to nudge Amitayus to take a small stroll on the cliffs. He was also curious to see what business this fellow who did not look like a Buddhist monk had constructing cairns. The cairns and colourful prayer flags were the hallmark of this Buddhist landscape and there was nothing to worry about them. 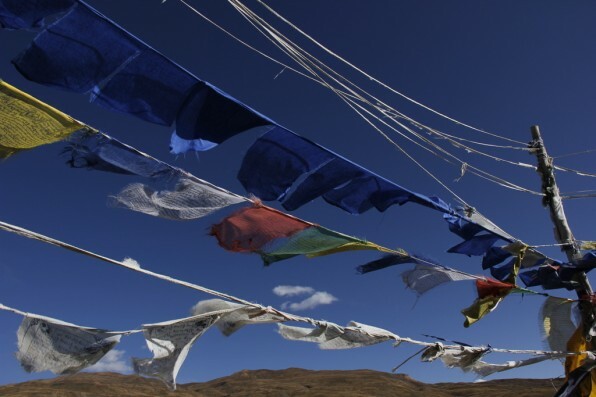 Buddhist prayer flags with prayers inscribed on them are thought to spread goodwill and well-being in seven cardinal directions. To the utter surprise of Amitayus, the cairn emitted a gentle red glow the moment he approached it and the glow became more intense, the closer he approached. He had never seen a cairn like this before, but it did not seem to do any harm either. Satisfied with the exploration, Amitayus returned to the relative safety and comfort of the cave, where to his great displeasure, a red fox was making good of his precious food. Chasing it away, he stretched himself, yawned and then sprawled over, gazing at the star studded bright sky. He drifted into the memories of his childhood when he did not have to worry about either food or shelter as there was a mother to provide for all of it. He could hardly remember the face of the mother or that of the other siblings, but one thing he still remembered clearly; the stars were the same then as they were today. Lingering in the sweet thoughts of whatever he remembered of his childhood, he drifted away to sleep. Night in the Himalayas. 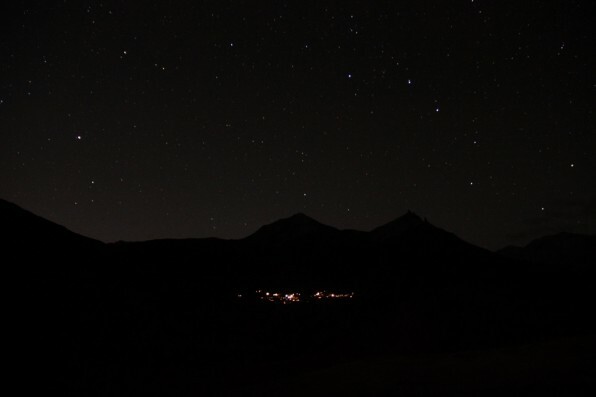 Twin mountain peaks, a village nestled within and the starlit sky provide a magical quality to the night. 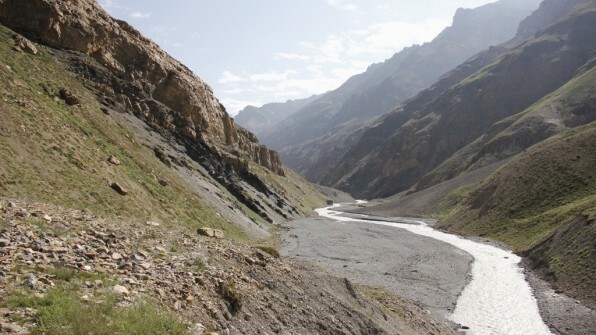 Meanwhile Thinley despite scanning the mountains all day had not succeeded in even getting a glimpse of a snow leopard. He had returned to the base camp cold, tired and hungry. 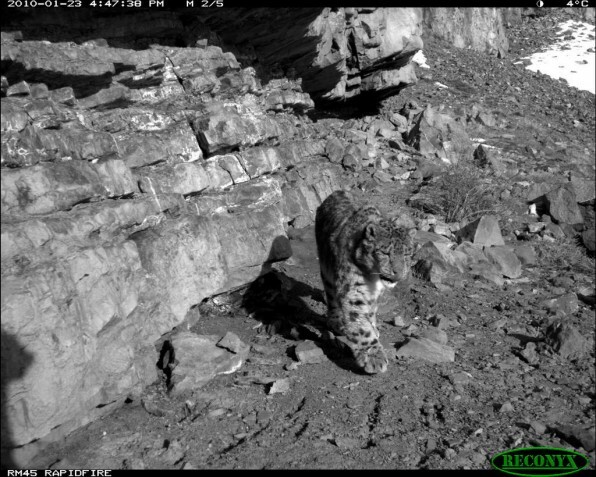 Next morning he decided to intensify his search for snow leopard signs and scats as he planned to deploy more of those cairn disguised camera traps for better monitoring of snow leopards. He also hoped that this wandering around might one day bring him close to a snow leopard! 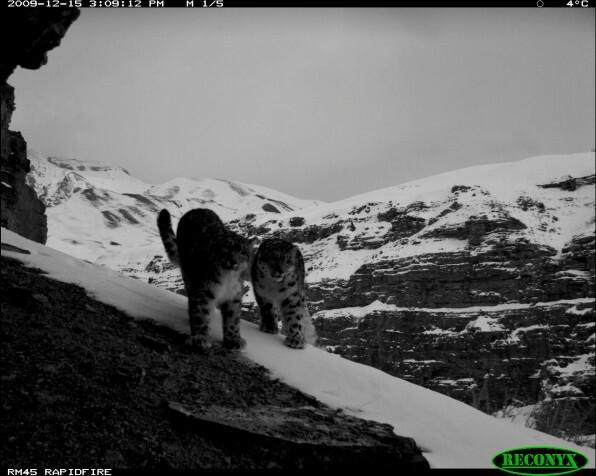 With the help of other knowledgeable villagers and livestock herders, who had intimate knowledge of snow leopard movements, Thinley had managed to identify several places where the snow leopard would pass and a covert camera would record its presence. On a similar reconnaissance trip one day, he had spotted a horse in a meadow, lying about 200 meters from an overhanging cliff. He quickly pulled out his binocular from his sling bag and was thrilled to see a snow leopard lying next to the dead horse. Though he had seen snow leopards a couple of times before, this was the first time that the cat with the uncanny reputation of melting away in the mountains, lay right in front of his eyes. Thinley just could not take his eyes off the beautiful cat with the smoky grey coat adorned with dark-grey rosettes. He could no longer resist taking a few more steps to see the cat up and close. Taking one cautious step a time he gradually moved forth. 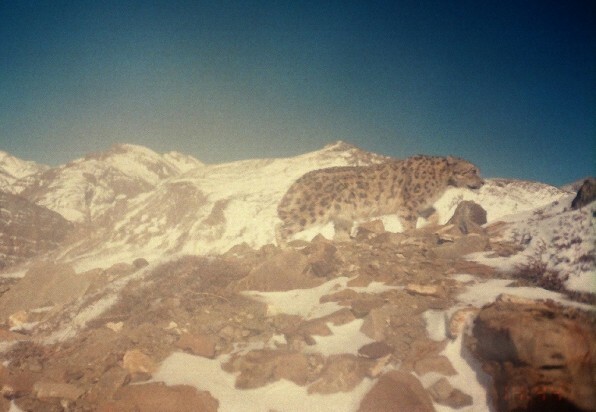 At one point, the snow leopard raised its head and stared at Thinley, but he was undeterred. A few more steps and the cat crouched besides the dead horse, baring its long-sharp canines. This aggression shook Thinley and he decided to retreat his steps, but not before he have had a good look at the snow leopard. The small stump in place of a long thick tail struck him and would remain etched in his memory forever. Amitayus photographed by an automatic motion sensor camera in the winter of the year 2008. Throughout their range in Central Asia, which is spread across thirteen countries, there is not even a single instance of a snow leopard killing or injuring a human being. It is astonishing that a cat that can bring down a full grown horse would not harm human beings. 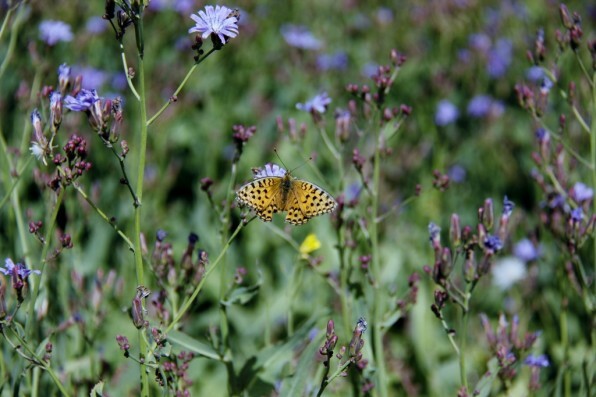 The waning of flowers was signaling a retreating spring and the onset of a short autumn, which would then soon give way to a long-harsh winter. People in the villages were busy harvesting their precious crops of commercial green pea and the traditional barley. 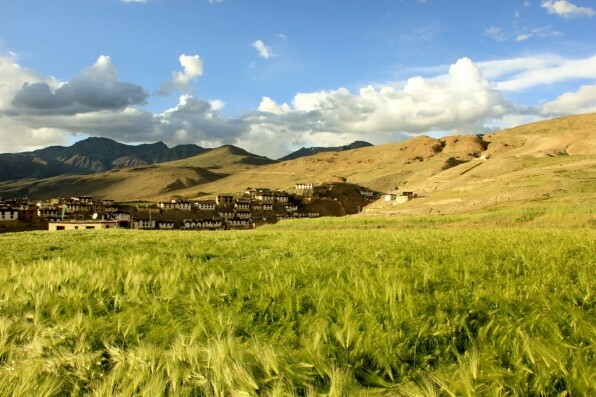 A village in the Trans-Himalayas with its crop of barley. Besides being a nutritious food, barley has high religious-cultural value and is the primary ingredient of the traditional brew. Thinley and his team were running around in the mountains, deploying camera traps at the strategic locations they had marked out earlier. Thinley was particularly excited as he hoped that these cameras would be a window to the world of that stump tailed cat that had one day left him stunned with its beauty and courage. He and his team would set out early in the morning, maintaining their delicate balance on the ridgelines, while the furious wind threated to uproot them and fling them down into the yawning gorges. Memory cards brought back from cameras far and wide revealed several beautiful cats that had posed in front of the cameras. The team was particularly thrilled to see a female with two playful, cuddly young ones. Amitayus was ubiquitous and was found to cover a large area which included the area covered by the female with cubs. Probably he had sired those cubs, but one could not be sure. The effort was rewarding enough for the team to continue with for years, and year after year, Amitayus kept gracing the cameras. While surfing through some of the recent photographs that the team had brought back, Thinley’s keen eye noticed the battered and tired face of Amitayus. Also the camera traps revealed that numbers of places that he often visited and had formed a part of his large kingdom were now reduced to a handful. The entire team was now a worried lot. Thinley’s natural cheeriness seemed to have evaporated into the thin mountain air and the once mischievous eyes now gave out a dull, sad look. Without anyone noticing, he was making four trips a month to each of the cameras instead of the usual one. He found it difficult to express himself and make anyone understand why he would be so worried about one particular snow leopard when there were many others around. The two cubs had again appeared in front of one of the cameras and a faint smile donned his face when he saw that they were growing bigger and more mischievous, this time running after a bewildered adult blue sheep male. Two of the snow leopard cubs, growing older and bolder. NCF-SLT camera traps have been monitoring these two cubs and their mother since the year 2009. The report of livestock killings which had surged in the past four months had trickled down substantially. Thinley had made sure that all such killings were swiftly compensated as deep down he worried that it was the now old and weak Amitayus, who was killing livestock. Belonging to the same community, he knew that pushed to the brink, the herders sometimes would not hesitate to take extreme steps to protect their valuable livestock. On such occasions he often tried hard to ascertain the identity of the snow leopard and in his conversations with herders, he would often invoke the great teaching of Lord Buddha and the right of every life form to exist. Deep down, he silently prayed for the well-being of Amitayus and other snow leopards. Buddhist prayer motifs. Often used in the rituals of the dead, these beautiful mud idols are created in thousands and are left in the natural caves or poured into the streams. On a bitterly cold winter morning, some monks on their way to a meditation cave found a snow leopard buried deep in the snow. Thinley’s heart missed a beat before he rushed to the spot, running and falling in the knee deep snow. After a while, his limbs refused to move even an inch and the cold mountain air choked his lungs. Never before had he felt so weak and helpless in these mountains. Somehow he managed to drag himself to the last 200 meters before he crashed on his knees just where the beautiful, but now motionless snow leopard lay. The monks’ lips were rolling out silent prayers for what is regarded as the most mysterious creature of the high mountains. Amitayus graces a camera again in the winter of 2010. This was the last we saw of him before the mountains embraced him in their lap. In Buddhist culture, such as in the Dolpo region of Nepal, the snow leopards are considered as mountain deities, extending protection to the sacred mountains and the people. 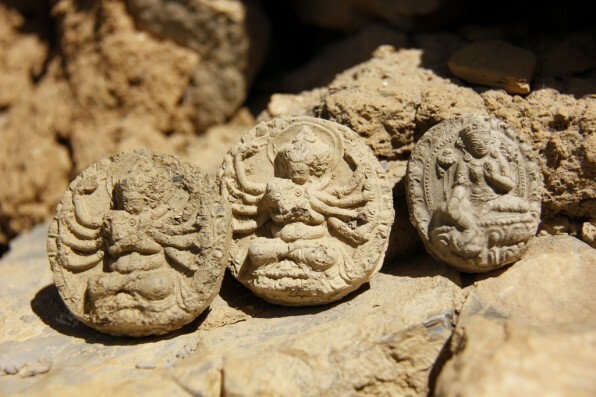 Old scriptures believed to be a 1000 years old, mention a great yogi named Drutob Senge Yeshe who arrived on a flying snow leopard to convert a dreaded mountain God to Buddhism. The mountain God resisted and a battle ensued. The snow leopard on seeing the mountain God assisted by snakes, reproduced itself one hundred and eight times and finally helped the yogi overcome the fearsome mountain God. Similarly the great yogi Milarepa to confound his enemies resorted to his black Nyingma-pa Tantra, transforming himself to a snow leopard at Lachi-Kang (Mount Everest). Wonderful, Rishi, with lovely images and imagery. It is not easy to articulate how one connects with a place, a species, even an individual, but you have done that really well. A reader cannot but be moved, too. What a touching tale! Thanks for introducing us to Amitayus and Thinley. May their tribe increase! Lovely writing Rishi, beautiful pictures too. Hope there are many more Thinleys and Amitayus in that landscape always. A great read. Thanks for documenting this with some wonderful images to accompany. A great read. And a lovely name, Amitayus. Felt like i was there- very moving….this was an event. peace to Amitayus and his tribe! A moving article. Totally transported me to this place. Thanks for the wonderful prose. Such a moving piece of writing! I felt like I was right there, with Amitayus, Thinley & the mountains. Very moving. Nice to get a different perspective on an individual snow leopard that all of you have followed, known and loved (apart from all the hard scientific camera trap data). May Amitayus rest in peace in the mountains of snow that he roamed. Really lovely to read this.